Caesar – one of the greatest men of all time, a politician that reformed the Romans and its kingdom. He is a fascinating person to say the least, and in this game, you get to see a whole new way of him. This is a game offering you everything Roman you can think of – the Colosseum, pillars, and knight’s armours. 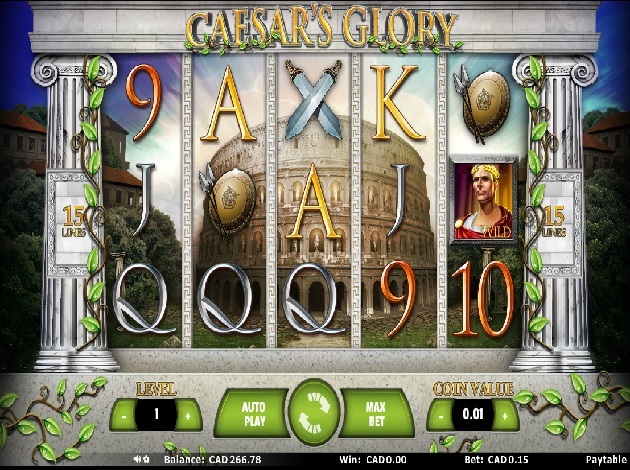 We proudly present Caesar´s Glory, a Video Slot brought to you by Join Games! As we mentioned, Join Games is the provider behind this video slot. They are relatively new in the business; they were founded in 2014 by two professional business managers that decided to get together and work as one. They are based in Malta, which is an island that has a lot of businesses within iGaming. The founders have a wide experience within gaming, and their vision is to create innovative slot concepts which their players will love. Their name – Join – symbolizes the union of the teams’ different ideas, and that they together work to reach their goals – to become a well-known game provider that creates creative and rewarding games. Join Games Malta Ltd develop all their casino games on their own, in-house, and work with business to business towards all operators that have a legit license from any of the gaming authorities like MGA (Malta Gaming Authority), Gibraltar, Isle of Man and AAMS. Some of the games brought to you by Join Games are The Dragon, Cyber Ninja, Zombie Escape, Kleopatra, Venice Carnival, and Aztec Temple. Starting Caesar´s Glory Video Slot, grants you a possibility to see and feel the magic of the ancient Rome and its kingdom. It was an era in time that had events of all kinds, with warriors fighting each other – a life that was all about surviving. The Colosseum was a place where these knights would fight, and usually, only one of them would walk away. Now, Julius Caesar was the reason the Roman kingdom finally fell. And maybe that was a good thing, one does not really know. What we do know – is that Join Games has portrayed this game flawlessly. The symbols of the game are all made to suit this theme flawlessly, with artefacts and symbolic symbols from this era. The lower valued symbols are the standard card deck symbols, ranging from 9 to Ace. These are worth between 100 and 150 coins, when landing on five of a kind. The higher valued symbols are then the roman ring, with a big rock, the ancient wagon in red and gold, the shield and spears, as well as the two crossed swords. These symbols are worth between 200 and 500 coins when landing five of the same, with the swords as the top player. Apart from these basic symbols, there are also a few extra special symbols that can grant you some extra wins and features. Ceasar himself is the Wild Symbol, while the roman knight is the Scatter Symbol. These can both award you wins and a rewarding Free Spins Symbol. We will reveal more about these shortly, and how they can award you. Caesar´s Glory Video Slot is a stunning game, with an interesting theme. The layout and the designs are very well thought out. You can see the reel set which is made from the roman, white pillars. On these, you can see the green vegetation of leaves and branches. Behind the reels, you can see the Colosseum in the distance, surrounded by old houses and trees. All of this makes for a colourful and fine layout, and it is all very cosy. The reels are made transparent to make the symbols pop out even more. The graphics and designs of the game are very well-made, and this all grants you a great feel and nice touch. Caesar´s Glory Video Slot offers 5 reels on 3 rows, with additional 15 paylines. Caesar´s Glory Video Slot offers a Free Spins Feature as well as a Wild Symbol – but a Bonus Game is not one of them. But if you are a historical fan, of Caesar at least, then you should check out Luxury Rome from iSoftbet. This is a game set in the Colosseum, offering a Wheel Bonus that can grant you up to 550x Multipliers. All wins in the Free Spins Feature are Multiplied by 5. The Wild Symbol is the one of Caesar himself, and this can step in to substitute for all symbols apart from the Scatter Symbol. This is also worth quite a lot, as landing five of a kind can grant you a staggering 5000 coins! Caesar is a fascinating man, one who changed things for Rome for all eternity. He is, in this game, a most rewarding and thrilling part – and without him you wouldn’t get that far. If you are into the Roman history and all it has to tell, then this is surely the game for you. It is a game you simply do not want to miss out on. We had a blast playing this game, and we know that you will too!